In our recent study on the topic of happiness, we learned that over 90% of women say that exploring and experiencing new things makes them happy. This desire for discovery and exploration extends to many different aspects of a woman's personality, including an enjoyment of attending cultural events in person. 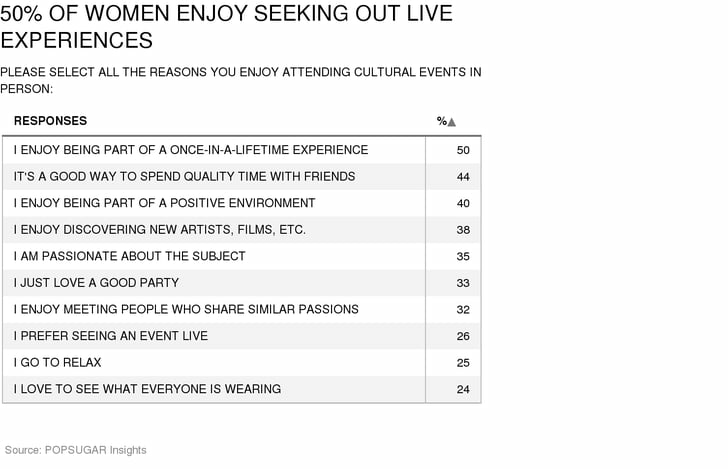 We wanted to explore the desire to attend events in person in more detail, so as part of the POPSUGAR Insights Content, Culture, and Commerce study, we surveyed over 1,500 women between the ages of 18-44 and asked them to tell us why they enjoy attending cultural events live and in person. Overall, 50% of women say that they enjoy attending cultural events (across all genres) in person because they enjoy being a part of a once-in-a-lifetime experience. Forty-four percent of women say that they attend because they feel it's a good way to spend quality time with their friends, and over 40% say they want to be a part of a positive environment. After the thrill of seeing something that's never been done before and spending quality time in a positive environment, the joy of discovery and deepening passions drive women to attend events in person. Thirty-eight percent of women say that they enjoy discovering new artists, films, or other things related to the events they attend, and 35% of women say they attend because they are passionate about the subject, sport, or event. Twenty-six percent of women say they prefer to see an event live and in person over watching it on TV or reading about the event online.